The Friends of the Fort Bragg Library are continually fundraising to support library programs and services. On behalf of Fort Bragg Library, the Friends welcome gifts from individuals, corporations, foundations, and estates for the general support and/or specific programs for the Library. You can earmark your donation to support a specific need of the Library (e.g. building fund, teen programming, outreach programs, etc) or donate for general purposes. 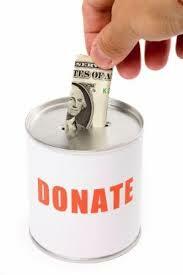 Donate online by using the Donation type listed below. 1. Cash: Give directly to staff at library and earmark for the Friends. 3. Matching Gifts: Multiply your dollars when your employers match your donation. 4. Wills / Bequests, Trusts, Gift annuity, Life Insurance, Securities, Real Estate: Leave a true legacy to Friends of the Fort Bragg Library earning income and tax benefits for you and your family while giving to the library. 5. In-Kind: Gifts other than cash; such as books or technology may be accepted. You can also donate through your purchases at Amazon by shopping at smile.amazon.com and selecting Friends of the Fort Bragg Library as your charity. We invite local businesses to support libraries and reading in Fort Bragg through sponsorships of literacy outreach throughout the year. The Friends welcomes business sponsorship of reading programs, collections, and community development projects. Contact us at P. O. Box 2718, Fort Bragg, CA. 95437 or ffblnews@gmail.com for more information. Our 501(c) (3) (Tax ID 68-0013046) enables Friends of Fort Bragg Library, Inc. to receive tax-deductible contributions.